I started motherhood determined not to let Evie have too much screen time. I would say that still applies for TV, but I am now convinced that the iPad is a great tool for Evie's learning. She is, after all, a child of the future! As technology gets used more and more, especially with assisted learning, I see it as an advantage for Evie to already know how to use an iPad. Here are our favorite apps! Peekaboo Farm: When Evie first started looking at this app, she didn't understand that she should hit the screen to see the animals. Now she understands Cause and Effect, and gets rewarded by a cow appearing and mooing at her. This is not to be confused with Peekaboo Kids (instead of Farm), which isn't bad, but shows certain animals answering nature's call and then cackling, if you're offended by that. Peekaboo Fridge: A variant of Peekaboo Farm, but just as good. If we are teaching her about food, then why not? They also have Peekaboo Christmas, Peekaboo Halloween, and Peekaboo Forest. I personally don't like the Halloween and Forest versions. Smart Rattle: This is not a high tech game. But it's riveting somehow. Every 20 seconds, the scene changes and objects like farm animals, cars, ocean life, etc float across the screen and make noises or spin around if the baby touches the screen. Evie could stare at it for hours. You can shake your phone and make the animals shake around too. She has great coordination with holding an iPhone (of course). Leapfrog Toddler Rhythms: Evie loves music, and she loves this app. She can sit with this app (just staring and listening) for an hour if I let her. 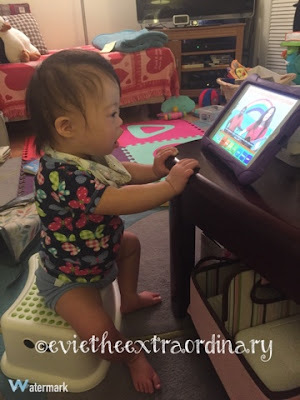 Baby Sign: Evie likes watching the baby sign words, and we learn baby sign language slowly. Very slowly. With nice splotches of drool on my iPad screen. Giggle Gang: Somehow these little fuzzy circle people who sing when you tap on them make Evie mesmerized. There's a piano keyboard on it too. Good cause and effect. Patty Shukla: Our latest is the Patty Shukla Toddler App (volume 4). Patty Shukla's soothing yet fun voice has allowed me to reclaim my games in Words With Friends and catch a Pokemon here and there in the living room. Evie is fascinated with the singing and I've seen her following the motions of the kids on the screen. Her favorite song is 5 Little Penguins. That's my girl! Evie showing off her nice posture while sitting on her own (her legs could be less splayed, but it's a work in progress). I stumbled across a great care.com article called "22 Best Apps for Children With Special Needs." 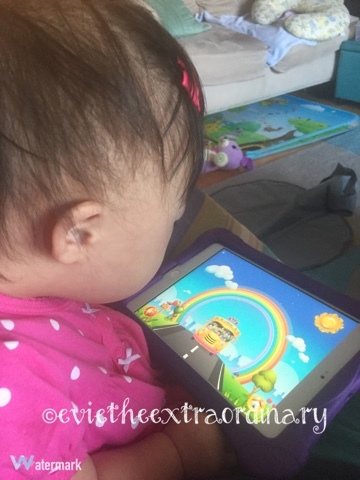 Included is a link to a mom's spreadsheet that lists apps for all categories you can think of: Communication for non-verbal children, Language Development, Math, Games, Music, etc. The article also describes recommendations by specialists for apps to help social cues, telling time, dexterity, and other important life skills. Please feel free to share any apps that you like for your kids, or any tips for helping Evie to learn more ways of communication!